I had some leftoever ground sirloin from our tacos last week that I needed to use up, and thought a burger sounded good for lunch. It was 3 ounces raw, and about 2.5 ounces cooked. Added 1 ounce sharp cheddar cheese, spinach, pickled jalapenos and lots of mustard (which I LOVE!). What caught my attention was that their barbecue sauce was a mustard/vinegar base. My husband quickly ordered me two bottles and their “magic dust” for my birthday last year. So good! 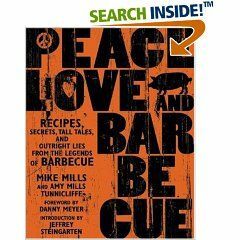 What I like about this book is that not only is it a cookbook, but a story of all the famous small town barbecue joints around the country, and how they started. 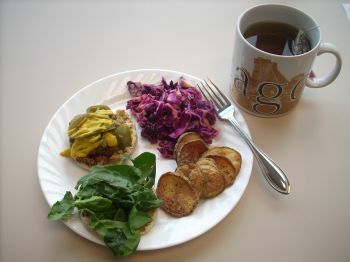 My side dish for today’s lunch was an adaptation of their red slaw cabbage (paired down to 2 servings instead of 10). Whole recipe is 106 calories, 1 fat, 26 carbs, 6 fiber and 4 protein. What made this slaw for me is another gift from my MIL, a hot sauce from Naples, Florida. 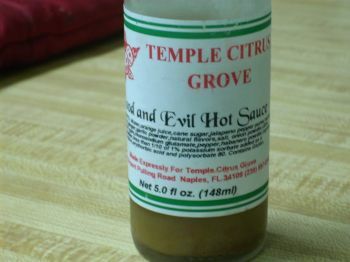 It’s called Good and Evil Hot Sauce and has a nice citrus hint to the hot sauce. I love hot sauces, but I am not just looking for the burn. It has to be flavorfully hot and this fits the bill. My other side dish was homemade potato chips. I thinly sliced 4 ounces of potato. Sprayed with Pam and sprinkled with french fry seasoning. Baked in a preheated 350 oven for 10 minutes. I then turned off the oven and left them in there overnight. It ended up being 1 ounce of potato chips.